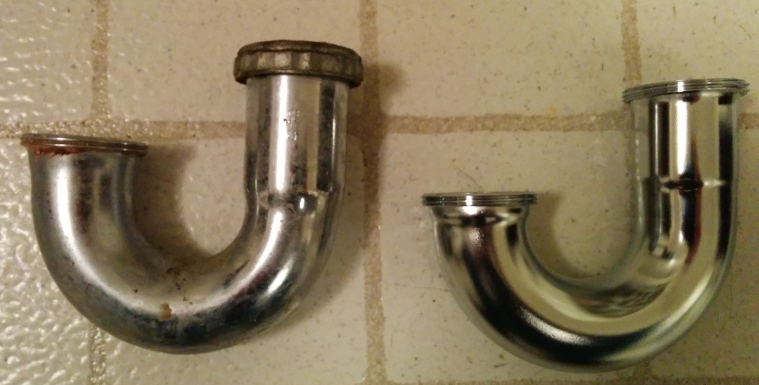 The j-Bend of my kitchen sink drain pipe rusted through and started leaking. I bought a new 1.5" j-Bend at Home Depot. Only when I got it home did I notice that the top part of the J is different than my old part. The old part allowed the tailpiece pipe to go down further into the J than the new part does. Because of the difference in size, the new part can't accommodate enough of the tailpiece to allow the other end of the J to mate with the other piece of the P-Trap. I looked online and couldn't find any j-bends that are sized like my old one. So what should I do? Should I get a hacksaw and cut the tailpiece down to size? Or should I go to a plumbing supply store to see if I can get a matching j-Bend? Or is there another option? Other than the J-Bend with a hole in it, the other parts of the drain are in good shape-- no visible corrosion, no leaks, etc. so I'd prefer to avoid replacing more than I need to. Trim the tailpiece to fit. A pipe cutter would be a bit more suitable than a hacksaw, but if you only have a hacksaw, just clean up well with a file after sawing. New tailpieces come quite long so they can be trimmed to fit. Not the answer you're looking for? Browse other questions tagged plumbing drain sink kitchen-sink or ask your own question. How to remove rusted remains of kitchen sink tailpiece? How to upgrade old sewer drain?